Why cloud computing? Because it's the best thing for small business since the creation of the stapler. Cloud computing can give you access to your business data and applications from anywhere at any time from any mobile device, at a reasonable price. The cloud gives small businesses access to technologies that previously were out of their reach and lets them compete with both other small businesses and larger ones. Many traditional desktop applications are disappearing, for example, many accounting software vendors no longer have desktop software offerings - they have moved their products to the cloud and offer inexpensive, online subscription-based services that are ideal for small businesses. For around $10/month vendors such as and offer cloud-based starter packages suitable for and , including invoicing, expense tracking, and simple reporting. You no longer have to pay for someone (or a team of someones) to do things such as install and update software, install and manage email servers and/or file servers, run backups – the beauty of cloud computing is that all of the business of maintaining the service or application is the responsibility of the cloud vendor, not yours. You no longer have to buy software. Besides the convenience of not having to buy software programs and install them on your own servers/computers, using cloud applications instead can be cheaper. You may be able to consolidate your separate application needs into one multi-application cloud computing service. For instance, includes email, a calendar scheduling application, Google Docs for creating documents, presentations, and forms and using online file storage and for creating websites, all for only $5/month for each person on your account. Even Microsoft's traditional office application suite, which used to be only available in desktop versions costing hundreds of dollars, is now available in a cloud-based version known as . It is sold by annual subscription and also includes online video conferencing, Skype and instant messaging connectivity, and many other features. More expensive plans include the desktop applications. Office 365 is now outselling the desktop office suite. Other cloud computing vendors such as provide a suite of cloud applications including CRM, calendar scheduling, email, conference calling, file sharing and an employee directory for as little as $10 per person per month. You may be able to cut back on system hardware. File storage, all take up a lot of space on servers/computers. With cloud computing, you use someone else's servers to store all this data instead, freeing up your in-house computer equipment for other purposes or even letting you get rid of some of it. A cloud computing application may make integration easier. Because many cloud computing applications include an Application Programming Interface (API) you may be able to find "compatible" applications rather than having to pay to have the applications you want to be integrated customized for you. 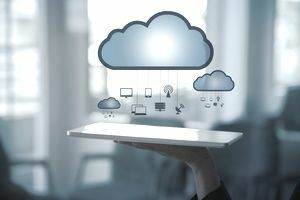 Cloud computing applications are regularly updated, so you don't have to spend time and money doing it – and giving you the advantage of always having access to an application's latest features and functions. Since cloud applications are browser-based they are accessible from mobile devices such as tablets and smartphones. For example, cloud-based accounting applications come with Android or Apple compatible mobile applications that allow you to access your accounting data from any mobile device and send invoices, track expenses, etc. on the run. that accessing office applications via a browser on a mobile device can be a less than ideal user experience, so Microsoft offers , such as Office for iPad. It's a lot easier and faster to sign up for a cloud computing application than to buy a server, get it up and running and install software on it. And because you don't need to buy hardware and software, your startup or expansion is cheaper, too.